The 2003 WBC Waterloo tournament was played using a Swiss format followed by two rounds of single elimination. Players could play one game per day, Tuesday through Friday, with the best four players squaring off for the semi-finals and eventual championship game. The 20 participants received points for wins, losses, factors eliminated and factors lost. Scores from the best three performances were used to determine the best four players. A 7PM turn is added to each day. Thus, the Prussian lV corps arrives two turns later. Only the first four days are played. This results in a maximum game length of 28 turns. The addition of the 7PM turn each day is not only realistic (Ligny and Mont St. Jean raged until after 9PM) but also helps play balance. Most experienced players believe that the PAA player had the advantage in the original game. Since the introduction of the 7PM turn, the French have won about half of the tournament games played. A total of 16 games were played in the preliminary rounds by 20 different participants, allowing Waterloo to again crack the 16-player threshold. 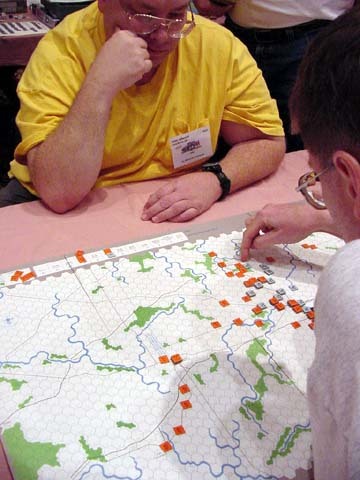 Contributing to this success are three things: The flexible format pioneered by Larry Lingle, a bunch of grognards looking for tournament games to play after they have been waxed elsewhere and the relaxed atmosphere among the cranks who hang on to the chance to play a game of Waterloo with an old friend. The Waterloo format consisted of an Open Swiss phase followed by a Single Elimination phase. The four best players from the Swiss phase squared off for first through fourth place. The best players were those who scored the highest based on their three best games using a formula similar to that used by VIP. 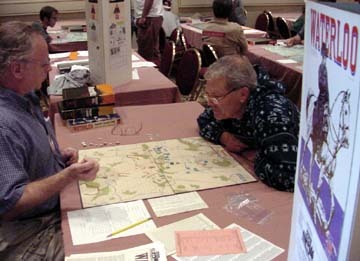 A player received 10 points for a win, one point for a loss and two points for each victory tallied by an opponent that the player defeated. A running total of all players' scores were prominently displayed at the Waterloo kiosk, with updates posted as each game ended. The key to this format is the record of the opponent that a player defeats. In past tournaments, many players hoped to avoid playing the "Great White Tournament Shark" Rob Beyma and other lesser sharks, as play against them usually ended their chances for a plaque. Not anymore. Players who racked up wins early found themselves being challenged by others who wanted a chance to score bonus points by beating a front runner. Two examples: Bruno Sinigaglio (Sand Shark) and Bill Scott (Mullethead Shark). Bruno, who was at 2-0, was challenged by a handful of hopefuls - he scheduled two of them in order to give them a shot, but as fate would have it, they got their butts kicked. Bill Scott, who was at 2-0, was also challenged by a group of climbers -Bill was goaded into a game by Marty Musella with some reasonable taunts. Bill agreed, in order to teach Marty a lesson, but an ensuing victory by Marty vaulted him up the leader board and was sweet crow to stick in Bill's craw. Of the 16 games played in the early rounds, only five were won by the French! This was definitely not the year of the Frog. The doncon Waterloo Tournament has witnessed some years when the French have won a good deal more than they have lost, and the overall trend has been near 50/50, so this may have just been a statistical adjustment. The four best performers during the Open Swiss phase were Bruno Sinigagliio with a record of 3 wins, two bonuses and an overall score of 32 points, Marty Musella with two wins and four bonuses for 24 points,Bill Scott with two wins and two bonuses for 22 points and john Clarke with two wins for 20 points. The semi-finals pit past Waterloo champion Bruno Sinigaglio with the PAA against John Clarke, another past champion. Bruno bid 10 to be the PAA, while John bid zero. John decided to play the French, because he wanted to control the flow of the game. This was not going to be a slow game. John maneuvered a good-sized force into position near Nivelles, while slowly advancing up the gap east of Quatra Bras. Then, on the morning of the second day, John launched simultaneous assaults southwest of Nivelles, southeast of Nivelles, along the Quatra Bras Heights and in the gap east of Quatre Bras. The well-executed plan was for naught as John rolled bad dice. The PAA escaped at Nivelles (two 4-1 Dbacks), while Exchanges were rolled in the gap and catastrophically versus Steinmetz on the heights. On the other hand, Bruno's counterattacks at Nivelles netted two Delims, while attacks in the gap and on the heights were exchanges. After this turn, the French were denuded at Quatra Bras and hurting at Nivelles. At this point, John resorted to low odds attacks, which eliminated one stack of PAA and three stacks of Frogs. Nappy and the silver exited stage south. In the other semi-final game, proverbial neighbors from Peoria squared-off. Of course, Marty's PAA had already slapped around Bill's French during the Swiss, but Bill was confident that an early 2-1 surrounded versus Steinmetz on the Quatra Bras heights would wipe the smile off Marty's mug. So, Bill bid zero to play the PAA, while Marty bid 6. The game was a match burner as our hero Bill rolled an AElim on the 2-1. Marty did not bother to counterattack, so Bill immolated his Frogs on the next turn with two 1-1 AElims versus the heights. Again, Nappy and the silver exited stage south. The French must maneuver on the first day, extend the PAA line all the way across the board from the road to Braine Le Comte to the Tilly gap and the woods to the east. Also, the French must be careful not to expose lead units or stacks to high odds PAA attacks. By the middle of the second day Bruno had stretched the PAA line in seven areas and his plan was to get a good first lick at the PAA near Nivelles. The PAA had lost about ten factors to none for the French. On the 1PM turn, Marty had shifted a good deal of his army towards Nivelles and the large stack of PAA Cav was moving south from Hal. At the end of the 1PM turn, Marty had denuded his forces in the center, so that only two stacks of 15 factors each were holding the Quatra Bras gap. There was no longer any possibility of PAA help from the Tilly corridor. Pirch and Steinmentz held the Quatre Bras heights. At this point, Bruno decided to shake things up. Marty was expecting the usual 4-1 attack with a soak-off versus the units in the gap. The PAA always has the advantage in that area, unless the French have a large factor superiority. So instead, Bruno sent his French in with orders to roll a couple 1-1's: two separate stacks of 15 French factors attacking two separate stacks of 15 PAA factors. Any combination of 1's or 2's (only an 11% chance) would blow a hole in the PAA line that would force a full-scale retreat and a bunch of PAA losses. Marty's eyebrows arched up at the comeuppance of the frogs. Two 4-1's with soak-offs were also launched near Nivelles. Uh-Oh! Bruno rolled two Attacker Elims at the Quatra Bras gap - 30 factors dead. An exchange and a Dback were rolled at Nivelles. Marty, seeing his center secured, pounced on the exposed stacks near Nivelles and killed two more large French units with a DElim and an Exchange. The factor count was now disastrous for the French. They were down 40 factors at the end of the 3PM turn, plus the inherent 47 factors down at the start of the game. On 3PM, the French launched a series of low odds attacks along the whole line. A lot of PAA units were eliminated, but even more French went into the dead pile. There you go again! Nappy and the silver exited stage south. Marty Musella picks up his first Waterloo Championship Wood. Congratulations Marty.